We are aboard a Metropolitan Water Reclamation District boat along with twelve others (among them several open lands advocates, a neighborhood historian, a 10th Ward staffer, and the head of a suburban park district) for a tour of the southeastern branch of the Calumet River System. From the yacht yard on 95th Street, we chug out into Lake Michigan for a panoramic view of the Illinois-Indiana skyline. Then it’s back into the mouth of the river, under the 95th Street bridge, past the bulk materials handlers, the metal scrappers, and the city salt storage piles. 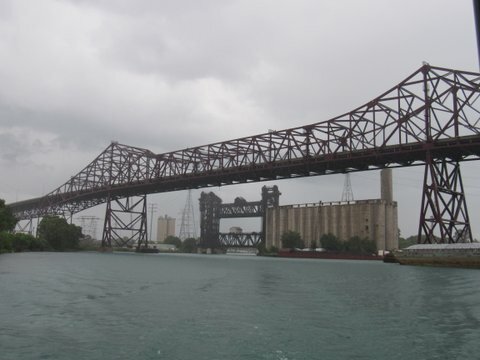 We scrape under the bascule bridge on 106th Street, glide past the Ford plant and then, finally, the engine slows and we sidle into the sleepy shallow wetland lake owned by the Illinois International Port District. It’s a rare opportunity to see the area, most of which has been privately held by industry for more than a century. That newly wooded parcel Shepherd points out was once the site of Wisconsin Steel, one of the Southeast Side’s largest steel mills. The mill shut down in 1980, leading off the collapse of the area’s once-booming steel industry. It was demolished some years later. Recently, there were hopeful whispers that the property might become a publicly accessible green space, an idea which even made it into a 2011 Illinois Department of Natural Resources issue paper—but later that year an asphalt company storage started building its plant on the southernmost parcel of the old steel site. Construction and scrapping operations now own other small parcels of the land, too. Still, much of it remains untouched. When the steel mills shuttered, they left behind acres of newly vacant land, much of it contaminated by industrial waste and chemical dumpsites. As the corridor filled with new industry in the following decades, none of it much cleaner than the preceding generation, the changing landscape inspired divergent visions for the corridor’s future. Activists and many Southeast Side residents saw in the weedy lots and crumbling infrastructure potential for soil remediation, and for parks and green businesses to take root along the river. But industry, and many politicians, looked at the same stretch of land and found it fit for business as usual, which is to say, dirty business: companies that fail to procure adequate environmental permits, fail to prevent toxic compounds like petcoke from blowing into residential areas and nearby athletic fields, and are regularly issued violation notices by the EPA—to say nothing of the industrial sites immediately over the Indiana state border that release toxic pollutants into Lake Michigan and its tributaries. Former steel mill sites on the river have been repurposed to both ends. At the mouth of the Calumet River, the former U.S. Steel South Works site went through a yearlong process to restore its topsoil as part of a University of Illinois program, and is now a popular park with a robust prairie restoration project. But further down the river, the former Acme Steel Mill became a KCBX petcoke storage site. Local residents campaigned for years to ban storage of the dangerous pollutant, which wind would carry into residential areas, in the neighborhood. As a result, the site no longer handles petcoke, and the northern KCBX terminal shuttered altogether. But the former Acme site, and the former Wisconsin Steel site across the river, are now the proposed dumping sites for silt, dredged from the bottom of the Calumet River and contaminated with decades’ worth of lead, arsenic, and cadmium. Nowhere is the tension between industry and environment so clear as at the Illinois International Port District, which we reach after an hour and a half on the river. Here, at the entrance to Lake Calumet, Shepherd hands the microphone to Ders Anderson, the greenways director at natural conservation nonprofit Openlands. 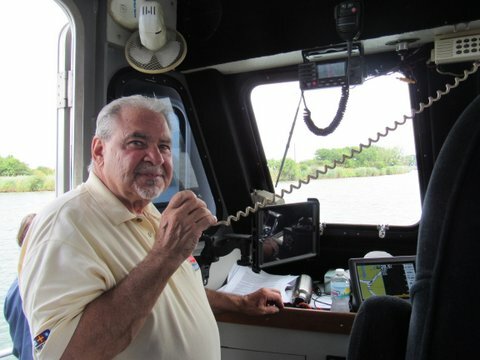 The captain slows the engine down and looks intently at the computer screen, which reports only nine feet of water below us. Once part of a patchwork of wetlands stretching to the shorelines of Lake Michigan, Lake Calumet was dredged and landfilled into existence. It’s filled with visual reminders of the industry that created it: a grain elevator that hasn’t been active since 1979, smokestacks in the distance, rectangular chunks cut into the shoreline for docking barges. (When we arrive, there is no other activity on the water: just an engineless barge docked to the side of the grain elevator, which Shepherd says is now rented out for storage.) Even its natural-looking formations tell of the lake’s industrial origins. A small patch of land near the mouth of the lake, Gull Island, is a landfill, Anderson reveals. So are the narrow grassy peninsulas that our boat floats between, built as part of the 1920 Van Vlissingen plan for shipping and industry. The lake has more to show for its industrial history than we can see from the boat. A flowering parasitic wetlands plant called Thismia americana was discovered in the area in the 1912 but hasn’t been seen since 1916, when industrial development was ramping up. In 2011, the EPA designated some of the slag-contaminated lands around Lake Calumet as a Superfund site. But in spite of the contamination, the lake remains immensely important for the ecosystems along the Illinois-Indiana river system. In addition to the lone stationary barge, the lake harbors large breeding colonies of regional birds like the Black-crowned Night Heron and the Common Gallinule. One of the state’s largest populations of Willow Flycatchers live there, according to the Audubon Society, and on a good day a visitor might even see a bald eagle flying overhead. The land is owned by the Illinois International Port District, a small, debt-ridden public port which brings in as much revenue from its golf course as from commerce, and which was recently described by a Sun-Times columnist as “a buffet table set for a party where most of the guests never showed up.” For the last two decades, residents have been organizing to turn several hundred acres of the port’s land, much of it unused and fenced off with barbed wire, into a public-access park. It seemed that the city and state were poised to do so after the Civic Federation recommended the port be dissolved altogether in 2008, and the Illinois Auditor General found little in working order in 2013. But then Gov. Bruce Rauner took office and nixed the park plan because, he said, it would cost taxpayers too much. He also shrugged off the port’s plans to expand its operations, vetoing a loan forgiveness bill that came to his desk in 2015. Illinois legislators overrode Rauner’s veto in November of last year, not so much offering slack in the District’s rope as untying its boat from the mooring altogether. In the time since, not one press release, news story, city report, or midnight tweet has offered any information as to the District’s plans. Our tour is briefly interrupted by a small yacht, the first non-barge boat we’ve seen all morning, looking for directions to the O’Brien Lock and Dam. As they head south toward the Mississippi River, and we back north, I am thinking about the inescapable feeling of inertia that weighs on the river. It’s not an inherent feature of the river itself, which keeps on fostering new life, even on contaminated grounds; this inertia has its source in real people, like Rauner, who reinforce the inscrutable idea that the only way forward is to wait—to see if a few more guests will show up at the Port District’s dinner party, or whether residents will notice the pollutants blowing into their open windows. Waiting is not the modus operandi of Southeast Side residents, and their alderwoman Susan Sadlowski Garza. During our tour of the river, Shepherd points out recent changes to the corridor—the lack of petcoke, the presence of air quality monitors at manganese-handling companies like S.H. Bell, the growing list of attractions at Steelworkers Park—that are the direct results of residents organizing against the companies that put their health at risk, the Planned Manufacturing District that allows them to operate there, and a government that, more often than not, works for the benefit of those companies. As we pass by one of the city’s salt storage sites, we get a small insight into the city’s understanding of what is normal, and what abnormal, on the Calumet River. 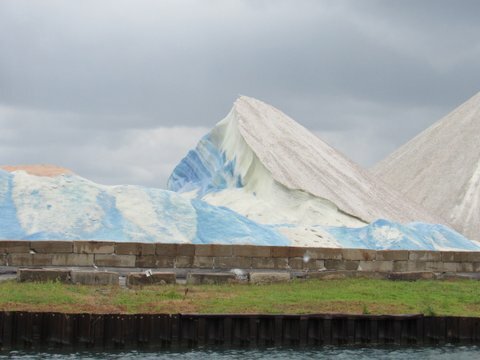 Our captain announces that he’s filing a “shoreline abnormality” report because city workers have left the electric blue and white mounds of salt uncovered. When left without cover during the summertime, he explains, salt can leach into the waterways, stressing the river’s ecosystems. Nothing ever comes of these shoreline abnormality reports, he admits, but he and his fellow captains are obligated to file them. Editors’ Note: Tom Shepherd has contributed to the Weekly. Emeline Posner is the Weekly’s food & land editor and a freelance writer. She last wrote for the Weekly about the city’s first hot sauce expo. Great article! Go get ’em Tom! South Chicago deserves better environmental quality! Thank you for this informative and interesting article. I definitely see salt piles uncovered regularly, dangerous looking loosely covered semi trucks driving perilously along east 106th street and toxic smells floating through the air we breathe. For my small part, I plant organic mammoth sunflowers in hopes of aiding in cleaning the air and soil. Many thanks to Tom and other area residents who fight to call attention to our environmental plight and to those who do their best to rally together against those who would take advantage of people who are battling lung diseases, heart issues and other maladies as a direct result of environmental abuses. 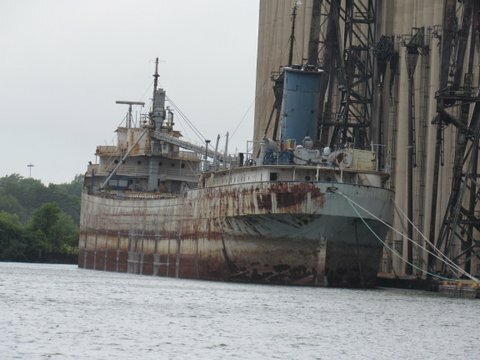 What is ship name and owner by calumet river grain elevator.